My entire life revolved around my swimming career. It was the first thing on my mind when that 4:48 alarm went off every morning, and the last thing I thought of while tossing and turning in bed each evening. It was a passion I couldn’t describe; I could only feel. After my first taste of international success at the age of 17, I committed myself to ensuring I had as many opportunities as possible to wear the Maple Leaf across my swim cap. As the youngest member of the Canadian swim team for the 2012 London Olympic Games, everything was new and everything was exciting. I hiked through the village in amazement at what surrounded me and the atmosphere was nothing short of electric. I made the most of the 20 days I had in the village; took in many other sports, the sights of London, and my time was highlighted with a Canadian record and two opportunities to swim in an Olympic final. Fast forward to another Olympic cycle. As I prepared for qualification at the Rio Games, I was coming off an injury-plagued 2015 season. Getting to compete and lead my team at the University of Georgia was all the motivation I needed to push past the everyday pain of training and become the strongest swimmer I had ever been. The year of training had been my best one yet, and after an NCAA Championship win and two new Canadian records set at the Olympic trials, I was confident and in a good headspace going into my second Olympic Games. I had a genuine belief that an individual medal was a realistic opportunity in either the 400 or 800-metre freestyle events. I was healthy, near the top of the world rankings, and training had gone exactly to plan. Rio would be the last competition of my career. I was 100 per cent confident in that. I am so grateful for all of the opportunities I experienced through the sport of swimming, but I knew my time had come. It wasn’t healthy mentally for me to continue anymore, and with past injuries continuously nagging, I wanted to leave while I still loved the sport and still had a powerful passion to compete. I held my Olympic medal in my hands at the conclusion of the Olympic Games and felt worthless. It was supposed to be a moment of accomplishment and satisfaction, but instead I was confused and felt that I had failed. I had achieved my lifetime dream, so why didn’t it feel like it should? I later learned that there were a lot of reasons for this; a nagging depression I wasn’t quite ready to accept, an illness that sent me into a foggy state, but most prominently, the moment that I had pictured in my head for many years didn’t look as I imagined it would. I didn’t feel like I reached my maximum potential when it mattered most, and no matter the glory at that time, I still felt defeated. Throughout my entire career, coaches stressed to me the fact that there is no such thing as an ideal competition. I was told to prepare for things not going exactly to plan, and to adapt to challenges as they arise. Part of our daily practise routine involved rehearsing the idea of being comfortable in uncomfortable situations. In Rio, I was uncomfortable. On the first day of competition, I set a Canadian record in the preliminary session of the 400. I felt great going into the finals. The pain was buried, my confidence was high. Then I finished fifth. Fifth! Below what I believed I had potential to achieve. I had a few days before my next race, which can usually be used to recover both mentally and physically. But instead, I came down with an illness that I later learned was walking pneumonia. I spent all the time that I could in bed, while still training a limited amount at a pool separate from the competition venue. Doubting thoughts continued to flood my head as the 4x200 freestyle relay was fast approaching. I had not only an entire country to represent, but also my other relay teammates who were depending on me to be at my very best for this race. I woke up the morning of the race and felt terrible. My body ached everywhere, my throat closed up and my head was continuously pounding. I had no appetite for breakfast, so I immediately went upstairs to see our Team Canada medical staff. I got the exact news that I didn’t want to hear: fever. Incredibly enough, we had a very deeply talented team and Emily Overholt was able to step up and fill in for me during the preliminary session. It didn’t matter how sick I felt that night, I had trained too many gruelling hours to let illness steal my chance to race. I was beginning to prepare for the finals session when I received a call from the coaching staff. They were putting me into the race. I was honoured and flattered to hear they had enough belief in me, deciding to place me on the team after the girls did an exceptional job of qualifying through to the finals. I had a chance to be a part of something special, and I was ready to make the most of it. With previous successes throughout the rest of the team, we used that momentum and confidence to propel ourselves to bronze; bringing Canada another podium performance. It was the exact team effort we were looking for, bringing six individuals to one common accomplishment. Four of us were new medallists; Katerine Savard, Emily Overholt, Kennedy Goss, and myself. The other two; Penny Oleksiak and Taylor Ruck, were adding to their medal tally which began earlier in the week. At that moment, this was everything to me. I was ecstatic as they placed the medal around my neck, saw the Canadian flag rise, and watched my family cheer from the stands. This was the highlight of my career. I wasn’t able to revel in it too long, however, I had another race less than 12 hours later, and there was still work to be done. A long competition is exhausting, and the emotional rollercoaster takes a whole lot more energy than you’d imagine. I only did one short interview, completed my race cool down, and left the pool as soon as possible to fuel my body and attempt to have a successful night’s sleep. 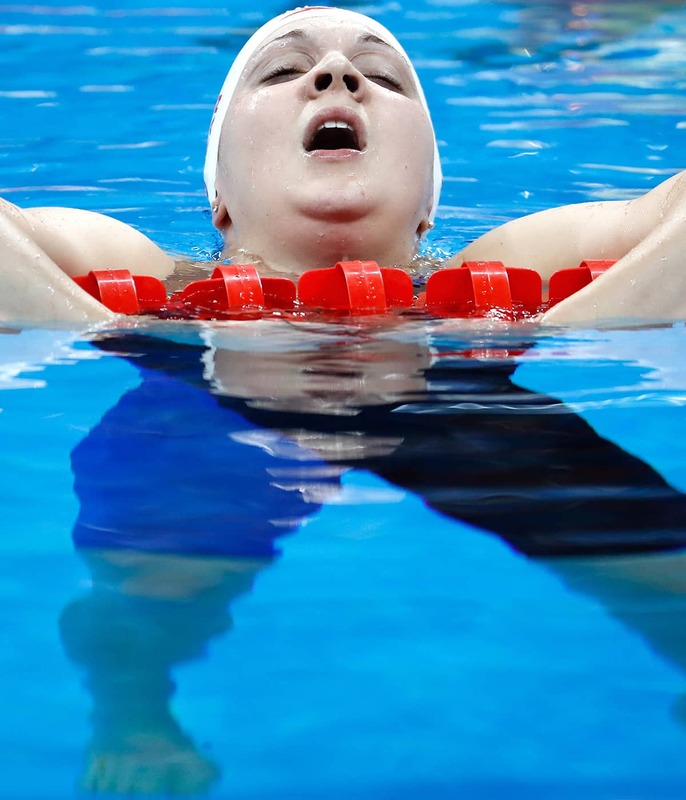 Canadian women capture Olympic bronze in the 4x200-metre freestyle relay. Whenever I broke down the event schedule of the Games, I pictured myself in the final of the 800 freestyle. It was my highest-ranked event at the time, and I was confident I could qualify through to the top eight that would compete on the Friday evening session. I knew it would take a time of around eight minutes 25 seconds to make it into the finals, and after swimming a relaxed 8:21 at Olympic trials, this was a realistic goal for me. So when I prepared myself for the exact moment of my retirement, I didn’t really imagine it to come on Thursday morning. It did, in fact, take an 8:25 to qualify for the finals; I just wasn’t able to perform when I needed to. I stood on the blocks encased in the roar of the crowd, yet I could not hear a single sound. I knew in that moment I did not have any physical strength, and the mental strength I had remaining was running low. I was depleted, and my career was about to come to a close. I tried to keep my mind in a positive space. The only sound I heard was the call of the starter, and I dove in shocked by the feeling of the cold water embracing my body. All of a sudden I had feeling; I felt the pain of exhaustion, the pain of failure, and the pain of knowing it was all about to end. I battled through every stroke. In a distance-swimming race, usually you try to hit a rhythm to take a little bit of force out of each stride. But I was not hitting a rhythm; I was hitting a wall. The top-eight qualifiers from the preliminary session move on to the finals where medals are awarded. As I approached the final touch, I began to realize this may be the last time I would race at an event at this calibre. Looking up at the clock, I saw my name displayed in 10th position. I had missed qualifying for the finals, and just like that, my swimming career was over. No one can prepare you for what that is like. Every practice comes to an end, every competition comes to an end, every season comes to an end, but you have never experienced an “ending” quite like this one. At first there was denial; this couldn’t be real. I had planned the whole year to be finished after the 800-metre final. I had convinced myself that was just a given. That was my strength, the distance where I had achieved previous international success, and my focus throughout training that season. I knew I was capable of being one of the best in the world in this event. But on that day, I was 10th. And 10th meant it was time to hang up the cap and goggles, take off my skin-tight racing suit, and face my coach post-race knowing that this was the last time I would do so. I can’t blame it all on the sickness; there were multiple factors that led to my disappointment that day. But this was my last Olympics; a once in a lifetime chance that I could never get back. It was a tough pill to swallow knowing I wouldn’t get this opportunity again. It was over, and there was nothing I could do to change it. I was prepared for retirement, but the finality of this moment was overwhelming. There is no right or wrong way to feel. Emotions are sometimes uncontrollable; thoughts race around in your mind, no matter how hard you try to stop them or slow them down. And guilt for these obscure feelings continues to linger to this day. I came home to an airport full of cheering fans and a home draped with banners and cards from loved ones. They all shared their excitement of watching me on TV, standing on the podium. It became apparent to me pretty quickly that no one was ever aware of my personal failures. No one was able to see the behind-the-scenes action, no one was able to see the way I struggled; they only saw that one moment of glory. It’s that one moment that will remain on their minds, the takeaway memory. All they see is an Olympic medallist. But to me, it’s all of the small failures that I’m not able to let go of. I have such a passion for the sport of swimming. It has taught me life values I couldn’t have found anywhere else. It has brought me the greatest friends and has allowed me to travel the world. It pushed me further than I ever could have imagined. So I would not be okay just leaving that all behind and moving on from this sport. It is now my focus to keep motivating Canadian athletes; to give back to the sport that has brought me so much. I want to follow the future generation, share all that I’ve learned, and do what I can to be a resource for them. As every new person hoists my medal around his or her neck, it continues to gain more value. Watching a child’s eyes light up and listening to the excitement in their voices has been the most rewarding part of my swimming career. Every sport is a team sport if you allow it to be. It’s a two-way street; these young athletes have inspired me more than they’ll ever realize. It is a great time to be swimmer in Canada, and I will do what I can to remain a part of the sport that I love. Practising and perfecting your craft comes with a variety of failures. But even if you do absolutely everything in your power, things can still come crumbling down in the moment that matters most. What may be immediately hard to understand is that you are viewed as a hero. You have a country that relies on you to perform, and to positively reflect what Canadians stand for. If you get up, try your best, and act with respect, you have succeeded. People of all ages watch you and follow in the footsteps you create. In Rio, I saw myself as a disappointment when others saw me as a hero. Now that my time competing has come to a close, I will work hard every day to make sure those who are still following, understand how important it is to me to make a difference for generations to come. My work in the water doesn’t define my career, the way I reacted and responded to it does. I hope to be remembered as a vocal teammate, a passionate leader, a supportive friend, and a respected competitor. When they placed that hardware around my neck I thought most about the countless people who were a part of that medal. As a whole, I’m so unbelievably happy with the career that I had. I am leaving with lasting relationships, records, and memories that I will cherish forever. The biggest struggle of my retirement so far is not missing the pool or missing racing; it is the struggle to balance conflicting perceptions, trying to get my head in the same place everyone else’s seems to be.